Since 1950, people of all ages have enjoyed the popular comic strip Peanuts created by the American cartoonist Charles Schultz (1922-2000). One of the endearing young children who star in the strip is Lucy Van Pelt, whose many talents include operating a psychiatric booth and offering humorous insights about life to her brother’s best friend, Charlie Brown. At the front of the booth is a sign that usually reads: “The Doctor Is In”. Two new promising peanut allergy immunotherapies have completed Phase 3 clinical trials and are pending Food and Drug Administration approval.2,3 The first treatment uses a peanut product AR101 for oral immunotherapy. The second treatment, Viaskin Peanut, is an epicutaneous immunotherapy that is also known as the “Peanut patch”. Lucy hopes that you have enjoyed her first dermatology case history and discussion. She is looking forward to giving more clinical presentations and promises to keep her consultation fees at her customary rate of five cents! 1. Peanut allergy. Wikipedia. https://en.wikipedia.org/wiki/Peanut­_allergy (accessed November 18, 2018). 2) Update on immunotherapies for peanut allergy. FARE. 1. Brian Maurer, PA-C: Yet another example of how like cures like. In medical discoveries there is a fine line between wisdom and serendipity. Perhaps a greater number of medical specialists could consider charging a nickel for their services. 2. Yael Dolev, Israeli nutritionist and food coach: I am aware of the research that claims that Israeli are not allergic to peanuts and therefore I was surprised to see a sign on the gate of a school in Tel Aviv that declared “peanuts free Zone”. 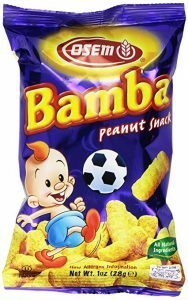 I am not sure if that is because we just imitate everything American, or we now have more kids with peanuts allergies, maybe Bamba went out of fashion. After all it is as addictive a snack as potato chips and no one should eat too much of this. I am not a health professional, just a food coach who believe that with the right food people can improve their well-being and fight inflammation, and most of all enjoy yummy food. Thanks for these comments. Below is a link from a 2017 post about food allergy in Israel. There is food allergy there, just not as much as in the USA and Israel has begun to implement guidelines for schools on how best to manage students with these allergies. This is an evolving process both here and in Israel. Fortunately progress has been made in our ability to prevent peanut allergy in infants and in immune therapy to mitigate the peanut allergy in those already affected. 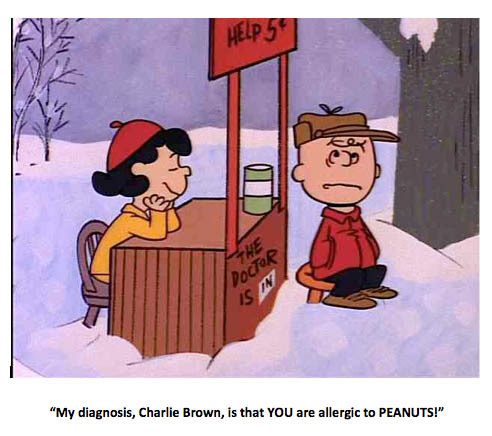 This entry was posted in Hoenig, Leonard J. and tagged Charles Schultz, Charlie Brown, food allergy, Lucy van Pelt, peanut allergy by humanemedicine. Bookmark the permalink.